The Last Great Cavalry Charge — Colin Dangaard, Inc. 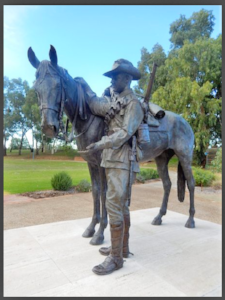 The story of the last great mounted charge in military history, as told by Colin Dangaard whose great-uncle Jack was one of the 500 men of the 4th Light Horse Brigade and was injured in this battle. The charge wasn't planned, it just happened. And, as history would note, it was the last and most successful traditional cavalry charge ever. On October 31, 1917, the 4th Light Horse Brigade of Australia -- 500 riders strong -- was assembled four miles outside of the town of Beersheba (a city now part of Israel but then a southern outpost of the Ottoman Empire.) Across four miles of burning Sinai desert several thousand Turks were entrenched, backed by the largest cannon in the world. The Australians had already ridden 170 miles to join Allied forces, mostly British. The Allies were essentially pinned down, forced to stay out of the three-mile range of the Turkish guns. The 4th Light Horse was commanded by Brigadier-General William Grant, who was shocked to find the Allies were out of water. The horses in his cavalry were so dehydrated their lips cracked and bled. Somewhere around noon that day he looked across the desert and made a decision that even he thought was suicidal. But his horses were dying. Grant mounted his horse, assembled his cavalry (scattered around so they would not make an easy target for German planes) and at 4:30PM rode to the front, drew what was then the world's longest bayonet, turned toward Beersheba and yelled "CHARGE !!!" One mile ahead, British Trooper Eric Elliot was hidden on a small rise, looking through binoculars and trying to spot enemy positions for Allied artillery. He heard the thunder of galloping horses, turned, and was so shocked he dropped his binoculars. He had just enough time to get on his horse and get out of the way. Elliot would later recall "It was the bravest, most awe-inspiring sight I ever witnessed, and there they were ... yelling, swearing and shouting .... As they thundered past my hair stood on end. The boys were wild-eyed and yelling their heads off." Turkish field commanders would later report that they thought it was a joke, crazed horsemen charging into the barrels of trenched machine guns, backed by the world's largest guns. Two miles into the gallop, Grant seriously questioned his decision. His men were whipping and spurring, fanned out at least five yards apart, trying to get whatever energy was left in their mounts. Grant imagined himself and his men being stranded there, horses spent, no cover, a clear and open target. But then, he later recalled: "Something incredible happened. The horses SMELLED the water in Beersheba. It was as if a great and new spirit lifted them. They actually galloped harder!" Now the Turks knew it was no joke. They opened fire, first with the machine guns, and then with the big guns in back. The machine guns cut into the leading horses and men, and they fell like pinballs, screaming in the blood and the sand. But that quickly changed. Almost all the Turkish fire was going over the heads of the advancing cavalry. So swift and improbable was the attack, the Turks had no time to re-sight their guns. Now the Australians were at the trenches, and a wounded trooper later remembered, "We got lucky. No barbed wire, and none of those horse pits too wide to jump." The Turks were not as lucky. The Australians scrambled from their mounts, emptied their guns, then jumped in with bayonets slashing, sticking anything that moved. "We were," recalled one trooper, crazed with a will to get the job done." Still in disbelief and in complete disarray, the Turks laid down their arms and surrendered. While some of the Light Horsemen were rounding up prisoners, others galloped into town, just in time to stop the Turks from blowing up the water wells. Within hours the Australians were joined by the rest of the Allies, the town was secured, and several divisions of Turks surrendered. The Australians sustained 25 dead, with more than 100 injured. But the course of the war was forever altered with this charge. The Turks lost their will to fight. The Ottoman Empire would fall. And the Allies went on to victory. This article first appeared in WESTERN SHOOTING HORSE in the January/February 2009 edition.